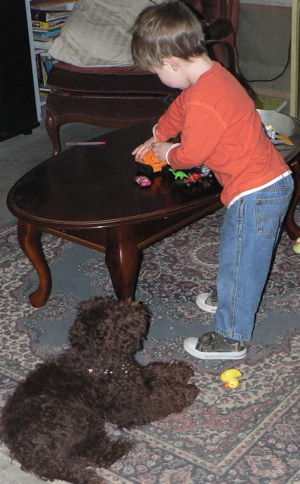 The Australian Labradoodle was bred to be a non-shedding, allergy friendly, service dog. Because of this he makes a wonderful house dog. He has no doggie odour and doesn’t leave his hair on the furniture. He is a fellow who needs human companionship to be happy. When he is grown he can certainly be trusted to be home alone while you are at work but he does need companionship. Any temperament problems we have encountered have been the result of a puppy or dog being left alone while his person went to work. It is not enough to plan holidays or even the entire summer off to bond with your puppy. A labradoodle is not a good choice for families who go out to work every day. He will get bored and lonely resulting often in behaviour problems. Some dogs go to work every day but this is not for every person or for every workplace. Please think carefully before you commit to this plan. We are reluctant to place a puppy in a home where everybody goes out to work and leaves puppy alone. A labradoodle is not the dog to leave out in the yard for most of his waking hours. He will become an unhappy, nervous barker. The Labradoodle is joyous. He loves a good game but will settle down when it is quiet time. That being said every labradoodle needs more exercise than he would get in the back yard. If your dog is restless or gets into trouble it is likely he is not getting enough exercise. A labradoodle is a great fellow to have on a hike. Even the miniature doodles enjoy a good long walk and have great endurance. Puppy is not ready for hikes. He is like a toddler and although seems filled with energy he has not grown enough to have endurance. It is not possible to be a ‘one man dog’ and a successful service or therapy dog. 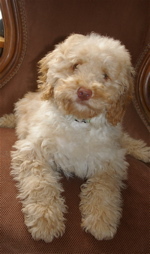 The Australian Labradoodle was bred to enjoy everybody’s company even though he is loyal to his special family. Although a Labradoodle will sound the alarm he is not by nature aggressive and was not bred to be a guard dog. Even small Australian Labradoodles are not constant barkers by nature. 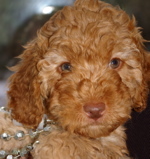 Although the temperament of the Australian Labradoodle is sound each puppy is as different from their brothers and sisters as children in a family. 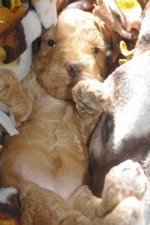 At Over The Moon we wait until the puppies are evaluated at 8 weeks of age to finalize puppies for families. Even though we all fall in love with photographs of a sweet baby sometimes the puppy in that photo doesn’t have the qualities your family needs. As this puppy grows we watch very carefully so that an active family does not end up with a retiring little boy when his litter mate, the outgoing girl would have been a better fit. We try our best to work with you to find the best possible addition to your family. 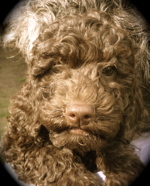 An Australian Labradoodle was designed to be happy, affectionate, not aggressive. He is easy to train. As a nonshedding, gentle family companion we believe he has no equal. 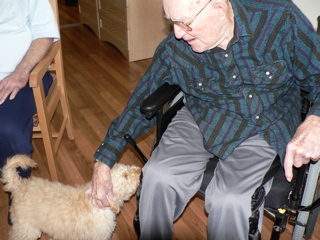 Our four month old Australian Labradoodle puppy visits residents of the extended care home in Grand Forks. Many of our puppies go on to become therapy dogs. It is time well spent for both dog and family. Ask a trainer near you what your dog needs to do to qualify as a therapeutic hospital visitor. 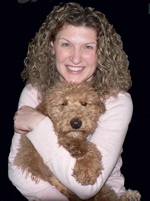 The Labadoodle is active but not extremely active. The larger the dog the greater their exercise requirement but after a morning walk and sniff round the garden they are very happy to lie by your feet for the afternoon and keep you company as you work at the computer. There are different numbers offered but the consensus is that 40 percent of a dog’s personality is predetermined by his genetic makeup,and 60 percent by what happens to him in his first four months of life. The dog’s breed determines his predisposition. A carefully bred, well socialized guard or fighting dog is still going to have certain traits given to him by his genetic make-up. However, early training and socialization play an even larger part in his adult temperament than the care his breeder has taken to give him the best genetic makepup, nutrition and healthy start he can have. This continued socialization includes playing with dogs other than the ones in his own family and meeting lots of new people and being in many different situations. The first forty percent is important! Good breeding is the foundation of a gentle natured, healthy dog. Make sure you choose a breed that has the potential to develop the attributes you wish in a dog. After puppy comes home it will be his family that develops that potential through socialization, training, love and patience. 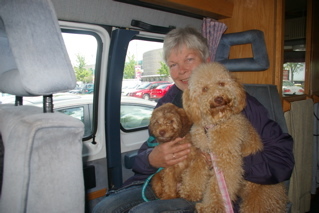 These two Over The Moon Labradoodles had a camping trip before they flew with their mum all the way to Holland.